Morgan is building the LifeCar to demonstrate, "that a zero emission vehicle can also be fun to drive." The tiny English car maker - better known for wood framed roadsters - is trying to do what no car maker has done before it: bring to market a fast, fun, desirable sports car that makes no sacrifices for its hydrogen fuel cell. Built on the same basic architecture as the Aero8, the LifeCar is given a more futuristic art-deco look as well as a significant reduction in weight. By combining that low weight with high levels of hybridization, Morgan predict the LifeCar will have performance to match a sports car while achieving a 200-mile fuel range. 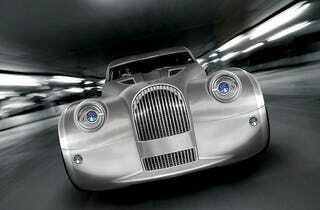 Morgan will debut the car at the Geneva Motor Show in March.